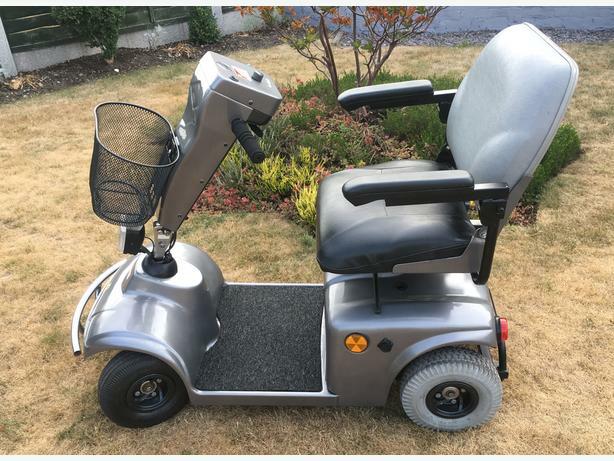 Easy to use mid size Class 2 mobility scooter completely refurbished and rebuilt. Brand new titanium silver paintwork, met blue alloys and Ferrari styling make this one off scooter a real head turner. 4mph variable speed, extra bright front and rear lights for those late night excursions, horn and adjustable seats with arm rests. Rear stabilisers offer extra support and the front and rear bumper bars offer protection against bumps and scraps. Comes with two brand new keys, a distinctive black and grey seat and an automatic charger.